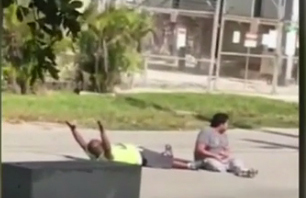 A Florida policeman shot and wounded an autistic man's unarmed black therapist on Monday, local media reports. Charles Kinsey, who works with people with disabilities, told WSVN television he was helping a patient who had wandered away from a facility. Mobile phone video shows Mr Kinsey lying down with his hands in the air, and his patient sitting in the road with a toy truck. North Miami Assistant Police Chief Neal Cuevas said officers were called out on Monday, following reports of a man threatening to shoot himself. Police ordered Mr Kinsey and the patient to lie on the ground, he told The Miami Herald. The video shows Mr Kinsey lying down while trying to get his patient to comply. He can be heard telling officers he has no weapon, and that the other man is autistic and has a toy truck. An officer then fired three times, striking Kinsey in the leg, Mr Cuevas said. No weapon was found. Police have not released the name or race of the officer who shot him but said he had been placed on administrative leave. The Florida Department of Law Enforcement is investigating the incident. In an interview with the TV station from his hospital bed, Mr Kinsey said he was more worried about his patient than himself during the incident. "As long as I've got my hands up, they're not going to shoot me. This is what I'm thinking. They're not going to shoot me," he said. "Wow, was I wrong." Mr Kinsey is a member of the Circle of Brotherhood, a collective of African American men and community activists in south Florida. "It could be any of us," Lyle Muhammad, a spokesman for the group, told BBC. "Here's an individual who is going about his daily employment and doing it well, and speaking clearly and following every single instruction he was given, and he still finds himself assaulted." I cannot stop tears running down my cheeks. The story above is too difficult to read, but cannot be buried either. Mr. President, the problem we are facing cannot be solved through politics or with money. As a nation we are going to need a sincere effort on both side to want to overcome it at the root. This will require a tremendous effort on all parties, a lot of humility from every one and a heart of love that we, human beings are able to possess, if we let it. It is obvious that our police force is behaving out of fear and consider everyone, but especially a certain segment of our population as extremely dangerous, no matter, how mild and gentile their behavior is. It is also clear, that some people are not capable today to overcome their resentment towards this kind of unfunded fear and are retaliating with the wrong weapons. Weapons of mass destruction are not only the kind we were trying to discover in Iraq. Weapon of mass destruction are the pain that we all carry in our heart because of physical, mental, and social abuse. Those weapons are a lot more dangerous because it is easy to ignore them. Though they are the one causing our destruction today. I have not watched much of the politics in the past many months, as there is nothing told of any value. The behavior of our politicians has been the kind we see in children 5 years old and younger, reciting a list of misdeeds that their peers may have done. I would have been a lot more interested in listening to a concrete plan on how each one was planning on solving the human crisis that we now have on our hands. It is not going away by simply wishing it. It will take a lot of courage for a politician to take on this kind of problem, but that is the kind of politician that we need. Let us not pretend that we can help the world be peaceful and stable. We are unable to do it at home. Let’s encourage every one of us, Americans, to be the kind of people that deserve the freedom we enjoy. Let’s take responsibility for our shortcoming and solve it together – we cannot do it separately – we have to work together. Stop the destructive and selfish politics and work together to bring humanity back to our society. For the sake of the future, please.